I read this article and wanted to share it with you: 5 Hacks to Nix Bad Homeschool Habits and Forge Good Ones Instead https://blog.sonlight.com/forge-good-homeschool-habits.html. About a year ago, I realized that I was checking my phone a few times during homeschool lessons. 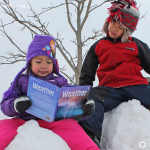 My sons never commented on it, but I realized that I wouldn’t much like it if, in between two books—or maybe in the middle of a page—they suddenly checked out to talk to a friend for a few minutes. How disrespectful! And yet that was what I was doing. 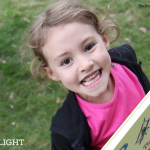 I was ashamed that I had fallen so easily into such a bad habit that affected both my parenting and our homeschooling. My disappointment with myself led me to research ways to change habits, and here are six of my favorite tips. I've used these not only to break my bad habit of phone checking during homeschool lessons but also to add positive habits to our routine. Last year I made a monthly checklist of habits I wanted to change and every day checked the ones I had done. I drank more water maybe three days total, so I eventually got rid of that one. But I thought of something to be thankful for just about every day. Success! Whatever habit you want to ingrain in yourself, in your children, or in your homeschool routine, use a checklist. Some of us tend to forget certain subjects from our day, so maybe we need a science checklist, a poetry checklist, or a handwriting checklist. Put the checklist somewhere visible, and let your kids in on the plan. They are great at keeping you accountable, especially if there is a reward at the end of completing the checklist. Although the 21-day rule gets thrown around, there’s no scientific basis in the maxim that it takes 21 days to change or establish a habit. Last year, I wanted to start each morning by asking God to go adventuring with me that day, and by praying for my family members by name. This kind of prayer takes less than a minute, and I thought, after five months, that the habit would be pretty ingrained. So I stopped tracking it for a month. And maybe it’s because my brain is not fully on when I first wake up. But still—after 150 repetitions, you’d think these prayers would be habitual! Nope! 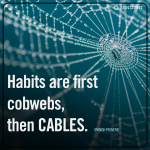 Current research shows that habits take something more like 300 repetitions to become solidly ingrained. That's nearly a year of something done daily! Aim to do your best and be okay with the flub-ups. You will make them. Keep reminding yourself that it takes a long time to establish a habit or to break a bad one. Celebrate your victories and give yourself grace when you fail. One speaker described this process as thinking like a mogul skier. The skier wants to get from the top to the bottom of the hill. But the skis will rarely point to the bottom. They’ll point left, then right, then left, then right. But the skier doesn’t go off the run, because the overall end point is fixed. Maybe your goal is to keep up with your Timeline Book this year. Last year you didn't touch it at all. So you start off with a bang and diligently place the timeline figures in the right eras, but then you skip a week or two. When you realize the lapse—that's the critical juncture. Or do you jump back in right where you are? Do the latter! And realize that you are much farther along in establishing a timeline habit than you were last year! Baby steps count! How you handle your own mistakes goes a long way towards teaching your children how to persevere! So even if you aren’t going directly toward your goal, perfectly, all the time—move in the right direction, and it’ll be okay. There’s a reason why we indulge at night—our willpower is gone. Exercising willpower takes actual effort and energy—both of which are in limited supply. In one experiment, a group of people who had to avoid chocolate chip cookies subsequently worked on a math problem less than half the time that the group of people who had to avoid radishes did. Why? The cookie avoiders had used their endurance on refraining from eating a cookie. They didn't have any energy left for the math problem. There are so many applications to homeschool here! Whatever is hard for you or hard for your kids—math, writing, science experiments—do those hard things first when your reserve of willpower is more abundant. On the other hand, avoid the triggers that expend your willpower. For example, if you want to stop checking your phone during school time, don’t bring your phone into the same room with you. This idea of temptation through proximity is one reason many families prefer a dedicated school area. When the TV and toys are out of sight, it's easier to focus on Read-Alouds and mapping exercises. This next story may be silly, but I bet you can relate. 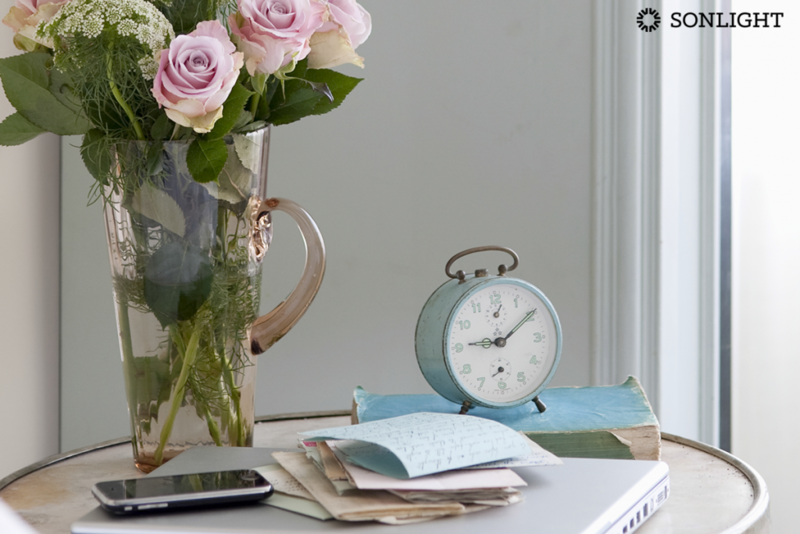 When my journal is on the dresser, a few steps from my bed, I’m not likely to write in it. 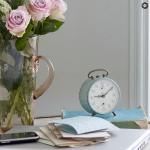 But when I started storing my Bible and journal in a beautiful magazine holder right next to my bed, my morning routine became far more consistent. Small changes like those—even if they seem frivolous—can make a difference. 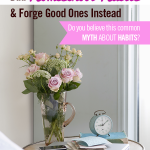 If something helps you forge a positive habit, do it! Maybe you need to set yourself up for success by investing in more bookshelves and storage bins so your homeschool resources are organized and you are more motivated to stick with your lesson plans. Maybe you need to hang the Markable Map on the wall and gather some vibrant markers nearby to spur your geography work. Maybe putting the nature study books, binoculars, and field guides in a basket by the window will inspire you to take time for bird watching. 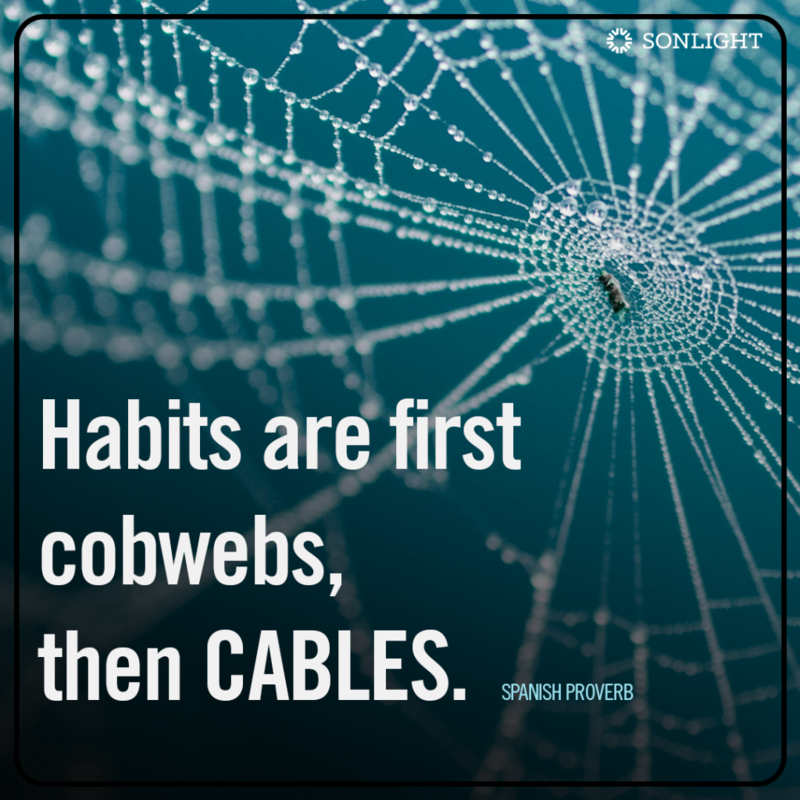 This Spanish proverb is beautiful: Habits are first cobwebs, then cables. What starts out as the most tender of resolutions can eventually become a natural part of our lifestyle—a good habit! We all have the possibility of change whether it's January, a new school year, or even a fresh morning.